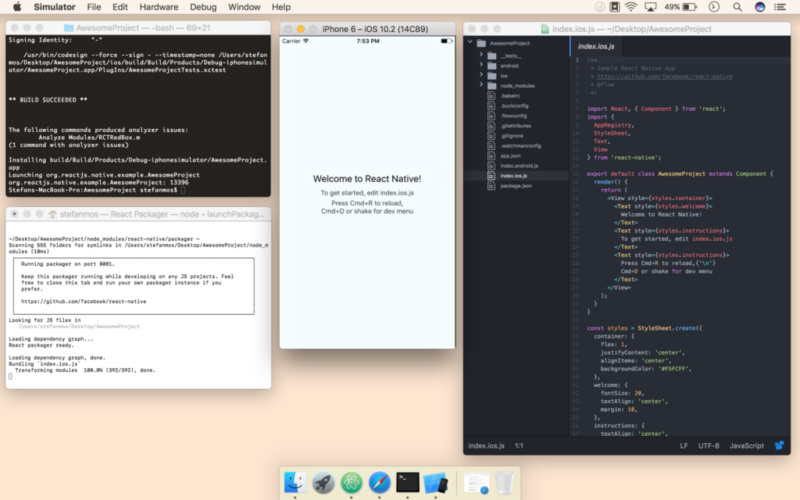 You will need Node.js, Watchman, the React Native command line interface, and Xcode installed locally. This will open up a second terminal window for packaging, and the Xcode iPhone simulator. Open up the index.ios.js. If you have worked with React before, you should be quite familiar with the way our code is setup. If not, don’t worry, I’ll explain every part as we move through the code. Firstly, when importing all the modules that you’ll be using inside of your component, you’ll notice, in the second import, that the generator has added AppRegistry, Stylesheet, Text, View. It’s pretty straight forward. If you need a button, you can simply just add Button inside of the import, and so forth. Next, let’s look at the component. When writing React components in ES6, you can make use of the class YOURCOMPONENT. This extends Component to create a new React component. Inside of this component you need a render() method and a return to send your component inside your view. As a note, your React component always needs to be enclosed by a block element. For instance, to tell React to render an ‘H1’ and a ‘p’, you would need to wrap these inside a div. In the starter example, you’ll notice that they have enclosed their component with a <view></view>. Reload your app, rinse and repeat, and you’ll have UI in no time.